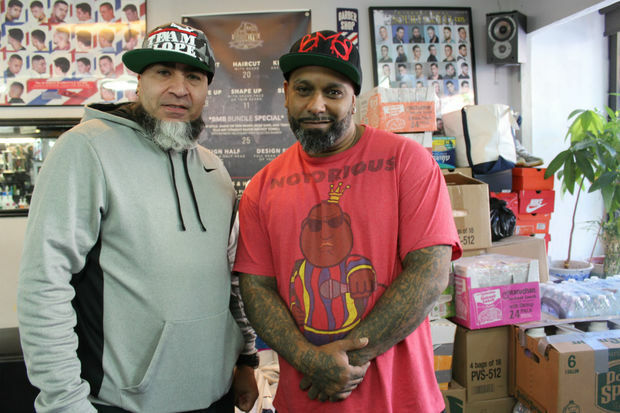 Owner of Brooklyn Master Barbershop Nester Guzman (right) and fellow barber Eric Casanova have converted the barbershop into a hurricane relief drop-off center for Puerto Rico. PARK SLOPE — Nester Guzman's chest ached as he watched Hurricane Maria thrash Puerto Rico, where dozens of his relatives are spread across the island. 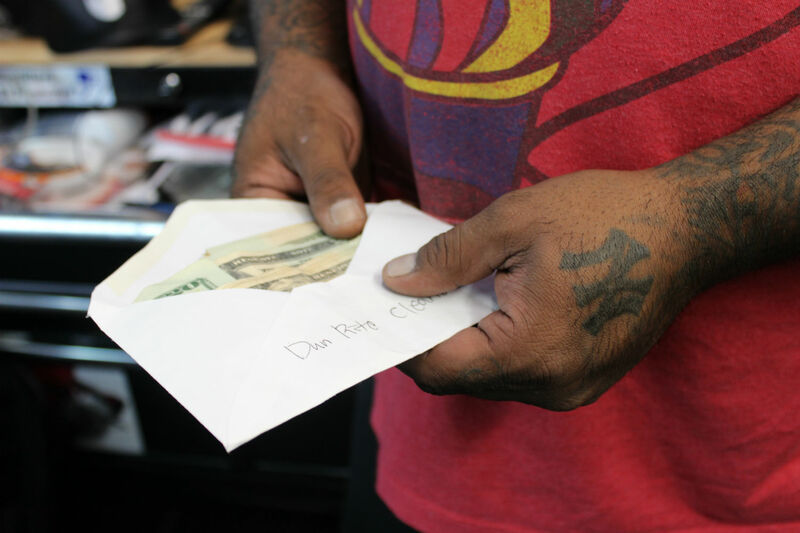 He couldn't get to his family, but donations collected at his barber shop could — so he sprang into action. His 15-year-old Fifth Avenue shop is a remnant of what once was a sizable Puerto Rican population in Park Slope and neighboring Gowanus. But as their numbers have dwindled, so has the tight-knit community that once thrived there, said Guzman. "There were a lot more Puerto Ricans here when I was growing up," said Guzman, 45, who is a lifelong Park Slope resident and has earned the nick-name "Big Nez" from locals. "Everyone used to know everybody. That was part of the culture, but it's disappeared since then." Nevertheless, in times of crisis people have a way of coming together, said Guzman. And the outpouring of recent support has been overwhelming. 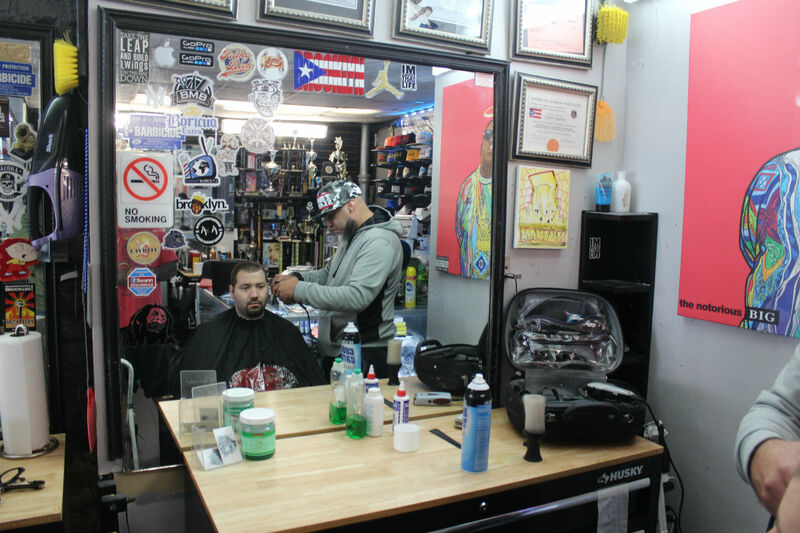 Since Puerto Rico was slammed by Hurricane Maria on Sept. 20, Guzman and his fellow barbers at the Brooklyn Master Barbershop at 395 Fifth Ave. near Seventh Street have gathered roughly 3,000 pounds worth of donations, sending the goods to the pummeled U.S. territory through Assemblyman Felix Ortiz' office and a group called The Brooklyn Way, said Guzman. Puerto Ricans from across the borough and other concerned locals have flooded the shop with canned goods, toiletries and feminine hygiene products that Guzman and his crew have packed into trucks to begin their journey to the island. Patrons getting their hair cut have dropped off care packages, the owner of the dry cleaners next door came in with an envelope full of cash and one local who wanted to help but didn't have the means to purchase donations spruced up an old baby carriage basement and rolled it into Guzman's shop. It's a reminder of when the area's Latino and Puerto Rican community used to come together in times of need. In 2000, the neighborhoods boasted more than 7,500 Puerto Ricans or roughly 12 percent of the area's population, a figure that dropped to 7 percent in 2015 with just under 5,000 Puerto Ricans calling Park Slope and Gowanus home, according to U.S. Census estimates. Guzman aims to head to Puerto Rico next week, either with Ortiz' office or on his own, where he plans to head to the nearest volunteer center to lend a hand. In the meantime, the barbershop is open for donations. "As long as it takes," said Guzman.